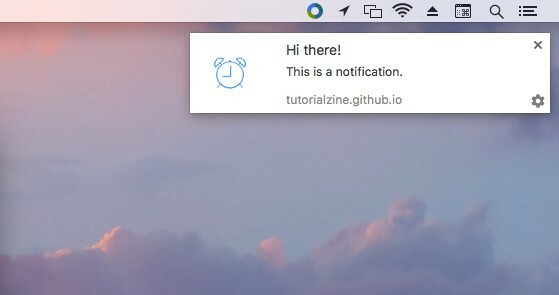 In this article we will show you the quickest way to set up browser notifications using the open-source Push.js library. We want to build a simple demo app that asks for permission and then sends notification on button click. For the sake of simplicity we will work in a single index.html file with inline scripts. The full source is available on GitHub. The Push.js library is not necessary for working with Web Notifications, but is offers a clean API which is much easier to work with compared to the native Notification API. Push.js will handle permissions, service workers, and cross-browser inconsistencies, so we don't have to. This will open the built-in browser dialog prompting users to accept or refuse to receive notifications. If permission has already been granted or denied, the above code will be ignored. timeout: 8000,               // Timeout before notification closes automatically. vibrate: [100, 100, 100],    // An array of vibration pulses for mobile devices. // Callback for when the notification is clicked. You can see all the available options here. 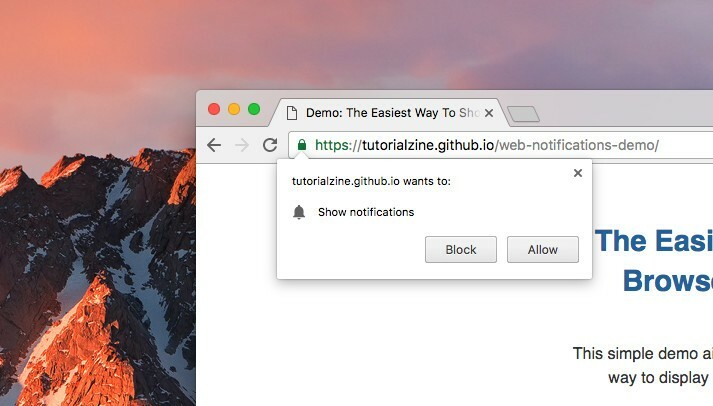 In our demo we display a notification on button click, but user interaction isn't required - new notifications can be created at any time, including when the tab isn't active at the moment. Make sure not to bother users too much. Send notification only when you want to update them on something important like a new text message or a new friend request. The Notification API is supported in most modern browsers. To see if your browser of choice supports it, try running our demo app. It should work without a problem in desktop Chrome, Firefox, and Safari, as well as Chrome for Android. The only popular client that's missing from this list is iOS Safari, which doesn't provide any form of web notifications. Another important thing to note here is that in order for notifications to be shown in Android, the web app needs to be hosted over HTTPS. A blog post by the creator of Push.js, discussing why he created the project and his future plans for it - here. Push API - An awesome new API that allows users to receive notifications even when a web app isn't open - here. What Makes a Good Notification? - A Google Developers article on how to make notifications better - here. That was easy! Thanks for sharing it here. Push.js is godsend for notification!